This is the transcript of the Live Blog session ending at 04:03 on 29 Jan 2014. 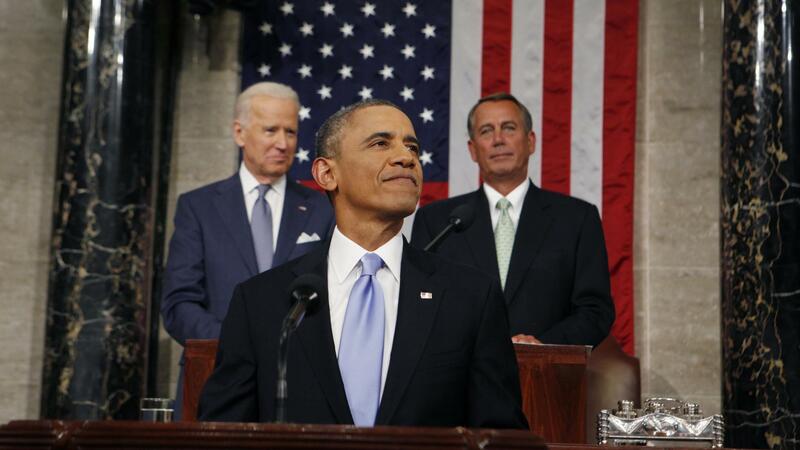 President Barack Obama went to Capitol Hill on Tuesday evening to make his fifth State of the Union address. Mr Obama tried to get on the front foot earlier in the day with the news he will bypass Congress to raise the minimum wage for federal contractors. The White House had lowered expectations for a speech that was short on big initiatives and long on “executive actions” – policies pushed by presidential decree, rather than going through lawmakers. The test will be whether Mr Obama’s performance will achieve its objective of restoring his damaged popularity following the botched rollout of healthcare reform. Welcome to the 2014 State of the Union. President Barack Obama is arriving at the Capitol with his wife, Michelle, and the House chamber is filling up with lawmakers. The room is getting more crowded as we await the president’s arrival. The FT’s Washington bureau has done a round-up of five things to watch for in tonight’s speech, including hot topics like immigration, economic policy and the US presence in Afghanistan. Michelle Obama has arrived, and the president’s cabinet is now walking in. Mr Obama will be next to enter the House chamber to deliver his speech – amid low approval ratings and a sense that his second term may be drifting away. Can he start turning that tide tonight? The White House is betting a message of determination to tackle income inequality and bolster economic security of struggling middle-class families will help him get out of the funk and energise the Democratic base ahead of the 2014 elections. But it is far from clear the gambit will succeed. Democratic aides are pointing out that many members are wearing blue ribbons tonight to demonstrate their support for extending federal jobless benefits for the long-term unemployed. They lapsed in late December, and efforts to renew them have languished. Several unemployed Americans who were cut off from their cheques are attending the speech as guests. Mr Obama opens his speech with an idyllic scene of middle class American life – a teacher spending extra time with a student, an entrepreneur flipping on the lights at her start-up, a car worker fine-tuning a fuel-efficient vehicle. Optimism and unity is an essential ingredient of any state of the union speech – and the president delivers it right at the start. “Tonight, this chamber speaks with one voice to the people we represent: it is you, our citizens, who make the state of our union strong”. The president quickly shifts to touting some of his biggest accomplishments : a falling deficit, the lowest unemployment rate (6.7 per cent) of his presidency, and America’s energy revolution. The troubles of Obamacare, his signature health care law, and the persistent struggles with Congress, mean that even the president’s successes don’t resonate too much these days, but that won’t stop him from pointing them out. And here is the MBA-like slogan for the speech: a “breakthrough year” for America, with a defiant message to all those who think the country is in decline. It has been three months since a debt ceiling crisis and a 16-day shutdown, and Mr Obama points out the need for Washington to “work better”. In December, a bipartisan budget deal was reached to replace automatic budget cuts and prevent new shutdowns, at least until October. But there is some fear that another episode of brinkmanship could still be around the corner when new borrowings need to be authorised next month. Mr Obama is getting into the heart of his theme for this year’s speech: to curb income inequality. After four years of economic growth, corporate profits and stock prices have rarely been higher, and those at the top have never done better. But average wages have barely budged. Inequality has deepened. Upward mobility has stalled. The cold, hard fact is that even in the midst of recovery, too many Americans are working more than ever just to get by – let alone get ahead. The president gives a shoutout to Mary Barra, General Motors’ new chief executive, who is sitting in Michelle Obama’s box tonight. I believe that here in America our success should depend not on accident of birth, but the strength of our work ethic and the scope of our dreams. That’s what drew our forebears here. It’s how the daughter of a factory worker is CEO of America’s largest automaker; how the son of a barkeeper is Speaker of the House; how the son of a single mom can be President of the greatest nation on Earth. Revamping the tax code is a top priority for business and one with bipartisan appeal. Mr Obama is rehashing his push last year to end tax deductions and loopholes on international profits and funnel the money into infrastructures. Bills in Congress along those lines are in the works and have recently gained traction, but it is unclear whether the effort will succeed. Comprehensive tax reform – the panacea for corporate America – that would lower rates across the board and slash all kinds of tax breaks – seems out of reach. Fairly early on, Mr Obama goes ahead and touts trade deals with Europe and Asia as helping small businesses that want to export. And he issues a carefully worded message to “work on” Trade Promotion Authority, which would speed those deals through Congress. Parsing the words, he did not urge lawmakers to pass the existing TPA bill in the Senate, which is facing Democratic resistance. Mr Obama lauds hubs for high-tech engineering in North Carolina – similar to a call he made back in 2011 for “our generation’s Sputnik moment”. That year, the FT’s Chris Booker and James Politi hit the road to visit one such high-tech manufacturing centre. Not a particularly lengthy statement on immigration from Mr Obama – but he says “it’s time” to get moving on it. The Senate has passed its own sweeping bill, and the big question is whether the Republican House will take it up. The skills gap is a persistent focus of debate among labour market economists. Even amid high joblessness, are some positions not getting filled because the workforce is not properly trained? Mr Obama here is calling for Vice-president Joe Biden to review federal job training programmes to see if they can be done better. And here is the segment where Mr Obama makes his latest appeal for long-term jobless benefits to be renewed. “Give ‘em the chance”, he said. “They need our help right now but this country needs them in the game”. Mr Obama is on a push to get CEOs not to discriminate against the long-term jobless in hiring. He is bringing business leaders to the White House later this week to make that pledge. Last year, Mr Obama called for universal pre-k education, paid for by hiking the tax on tobacco. It went nowhere – yet he is at it again. Mr Obama turns to “equal pay for equal work” legislation for women, garnering strong applause from Democrats. He says it’s time to end workplace rules worthy of a “Mad Men episode” – a reference to the TV series about a 1960s Madison Avenue advertising shop. Expect the Republican “war on women” to be a prominent feature of Democratic ads in the 2014 election cycle. Mr Obama’s push for a minimum wage hike is core to his speech this year, and he ushers it in with a folksy shout out to John Soranno, the owner of Punch Pizza in Minneapolis, who lifted his employees’ wages to $10, above the $7.25 federal level. “Say yes, Give America a raise”, the president says. Most viewers will find it hard to argue with that. There’s a few proposals knocking around Capitol Hill for new kinds of pension plans to encourage retirement saving and anything will be be welcomed by the industry since 45m Americans don’t have any pension savings and the rest of us undersave. The devil is in the detail, of course. So it’s difficult to validate any claim this would be a game-changer. Mr Obama is also calling for an expansion of the earned income tax credit, which helps low-income working families by giving them a rebate on their taxes. With the payroll tax cut expiring last year, it is seen as a key financial buffer for the middle class. Now Mr Obama is touting his 2010 health law, whose main provisions and coverage expansions took effect this year and which is fiercely opposed by Republicans. He challenges them to show how they can replace the law. About halfway through the speech, our Washington bureau chief Richard McGregor has a first take on Mr Obama’s “volley of presidential directives”. On Fast FT, Alan Rappeport looks at the role gun control played in last year’s State of the Union – which came not long after the Newtown massacre – and its absence from tonight’s speech. Mr Obama touts the success of Steve Beshear, the governor of red-state Kentucky, which has been among the most effective in signing Americans up for Obamacare. A direct challenge from the president to Republican Senate minority leader Mitch McConnell, who hails from the Bluegrass State. Turning to foreign policy, “America’s longest war will finally be over”, Mr Obama says. He says he will end combat missions in Afghanistan by the end of the year. But the president also warns that “we have to remain vigilant” without being mired in “open-ended conflicts”. There is only a short pledge to “reform our surveillance programmes” – striking given the furore over the Edward Snowden leaks and the NSA spying scandal that has dominated the debate about US intelligence practices for more than six months. Mr Obama moves on to tout and defend the nuclear deal with Iran, in the face of significant congressional scepticism from both sides of the political spectrum. Furthermore, the president unequivocally warns Congress not to introduce new sanctions on Iran. In advocating his “all of the above” energy strategy, with enthusiastic mentions in the speech for both natural gas and solar power, Mr Obama has drawn criticism from across the political spectrum. The American Coalition for Clean Coal Electricity, which represents the coal industry, accused Mr Obama of failing to “level with the American people” over the costs of his climate policies. Mr Obama takes some time to discuss America’s “soft power” – such as helping the Philippines at the time of last year’s typhoon. And he touts the US Olympic team heading to Sochi as expression of America’s belief in “the inherent dignity and equality of every human being, regardless of race or religion, creed or sexual orientation”. In the section of the speech on foreign policy, most of which repeated past commitments, Mr Obama said that a small force would remain in Afghanistan after the mission ends this year if Afghan president Hamid Karzai signs a security agreement. At times during the negotiations with Kabul, the White House has held up the prospect of a “zero option” with no troops remaining. Of course, all this depends on Karzai or his successor actually signing the agreement – which remains very uncertain. Mr Obama ends his speech with the story of Cory Remsburg, an Army Ranger nearly killed by a roadside bomb in Afghanistan. And he ties his struggle – and his uplifting recovery – to the fate of America. Tonight Mr Obama delivered an effective and optimistic speech from a weak political position – which could marginally help revive his second term and aid Democrats in 2014, says James Politi. And he managed to do so without appearing excessively partisan. But from a policy perspective, his agenda is far from ambitious – and this speech is likely to be forgotten fairly quickly as existing proposals continue to languish and new ones fail to advance. Cathy McMorris Rodgers, a congresswoman from Washington, is delivering the Republican party’s official reply to the speech, writes Barney Jopson. [She] said the Affordable Care Act was failing and blamed President Barack Obama for making it harder for people to find work. Both issues are likely to be central to midterm elections in November, but divisions within the Republican party were highlighted by the fact that the official Republican rebuttal was followed by two alternatives from rightwing Tea Party members. Also worth noting was Ms McMorris Rodgers’ rebuttal of Mr Obama’s main economic message. Republicans have frequently in the run-up to the speech pointed out that Mr Obama has now had five years to try to reverse income inequality and middle wage stagnation, but the problems persist. At the end of the day, the question is whether President Obama’s agenda responds adequately to his own diagnosis of the problem. If we are in the grip of decades-old shifts toward globalization and the substitution of technology for labor, as he insists, it is not clear that all his proposals taken together would do much to change the basic equation for working families. The president is betting that a steady-as-you-go strategy with modest incremental adjustments will be enough to restore rising wages and opportunity for all. In the judgment of the American people, the results of this strategy so far have been far from adequate. If the rest of the world cooperates, the next few years may be better. If not, the calls for more far-reaching changes will intensify. That wraps up our live coverage. Join us on FT.com for our full story on tonight’s speech and more coverage of reaction from across the political spectrum.